Bringing Berger Picard enthusiasts together from coast to coast! We look forward to sharing our passion for the breed with you! ​The first at Merrywoof Camp from May31st to June 2nd (a few places left) and the second at the occasion of the Berger Picard National Specialty August 24th in Long Sault, ON. at the Stormont, Dundas & Glengarry Dog Association all breed dog show. More Berger Picard gatherings may be added during this spring. If you are on this page you may already be enchanted with the Berger Picard, or perhaps you are about to be... The Berger Picard, considered to be the oldest French herding breed, is a true national treasure which has remained relatively unknown until recently. It was recognized in France by the Société Centrale Canine in 1925 and in Canada by the Canadian Kennel Club in 1992. Despite its European history, the Berger Picard has only recently arrived in North America. 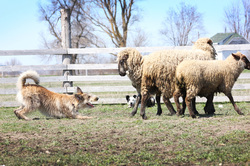 Breed enthusiasts have worked and continue to work very hard to have the Berger Picard recognized by various official registries of the continent. By bringing the Berger Picard to North America, we carry a responsibility for its future in our country. The Berger Picard Club of Canada draws from the expertise of its members to serve the Canadian Berger Picard, focusing its actions on education, mentoring and sharing of information so that everyone is able to make informed decisions, whether you are choosing a companion, participating in events, evaluating considerations for breeding, or researching health issues. The Berger Picard Club Canada works cooperatively with other Berger Picard breed clubs to maximize our efforts in finding solutions, especially with respect to eye health. Our role as a breed club is to preserve the integrity of our Berger Picards, in terms of their working ability, temperament, conformation and health. We want the Berger Picards which are bred in Canada to be worthy representatives of their breed in accordance with the standard of their country of origin. This website is the entry and meeting point for all Canadian Berger Picard lovers who want a dynamic breed club with a passionate focus on the health and character of these wonderful animals who share our daily lives. By sharing our diverse experiences and knowledge of the breed, we hope to create an environment of learning and education that all can benefit from, starting with our beloved Picards. We believe that together we can address the health issues concerning the Berger Picard and watch over the integrity and well-being of the breed. Our sincerest wish is that Berger Picard Club Canada is a friendly place where everyone can feel welcome, supported and encouraged in the expression of a common passion, that of the Berger Picard. Please consider joining us. Your support helps with club activities, breed education, health research and breed rescue.